PLEASE:  Click on any photo below to see a more detailed view. I like cruising and Joan loves photography. We are always interested in a very different kind of cruise that involves boating in a location just waiting to be photographed. 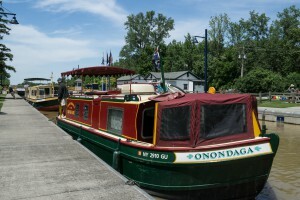 This led us to a week on our very own chartered canal boat on the Erie Canal. We loved it. The all-steel canal boat (34’ long for 1 couple or 42’ long for 2 couples) is spacious, comfortable, easy for a novice to handle after a brief orientation. The boat provides a fascinating trip along a quiet and safe canal, transporting you back in time to a place where people use antiques in everyday life. We also enjoyed the camaraderie of the others who rented canal boats and we repeatedly met at each dock. The nightly ritual of watching less experienced boaters try, over and over, to maneuver their boat alongside the wall was better than an evening of watching television. The Erie Canal is the United State’s first major engineering miracle. It is over 500 miles of hand-dug canal. The canal was cut through land of varying elevations, and was, in places, solid rock. Several areas required the canal be elevated above the land or even bridged above lower lying rivers. The Erie Canal was built before the first engineering school opened in this country. Our boat, a Lockmaster 34 named Onondaga, was built by hand with limited tooling by the father of the present owners of Mid-Lakes Navigation. The boats are beautifully designed inside and out. Ours had one double and two bunk beds, a small bathroom, a separate shower, a nice stove, sink and small fridge and, in short, everything a small New York apartment enjoys. It also had a screened front porch with comfortable seating to look out on beautiful scenery. Traveling the waterway is easy. 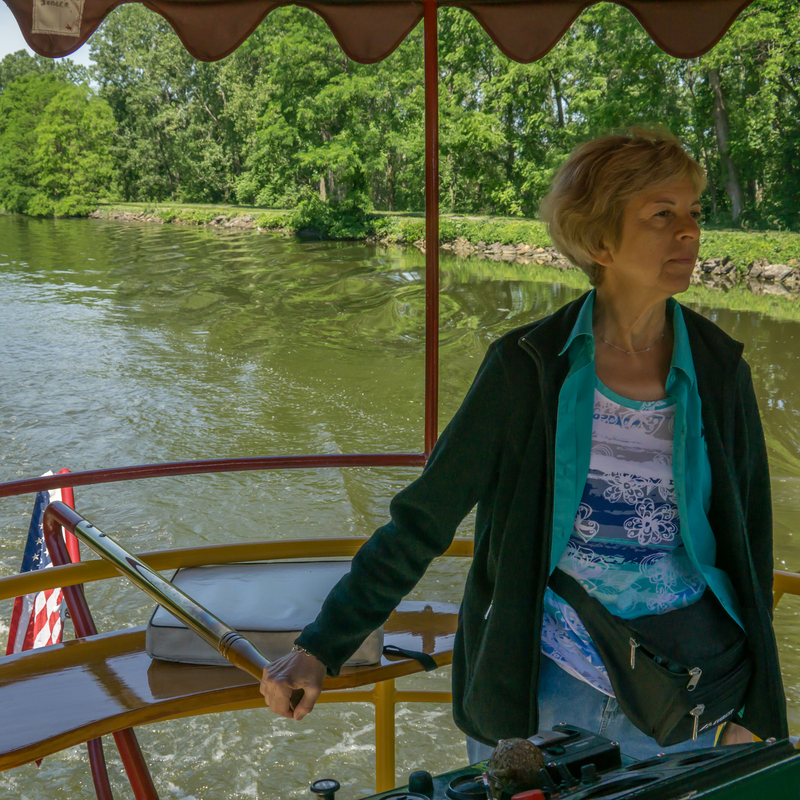 You don’t need a map; the Erie Canal looks in person exactly as it does in the books, a single line of water that travels East and West, slowly covering the land between the Great Lakes and the Hudson River. The original small canal and wooden hand-operated locks have been upgraded and replaced twice over the years. 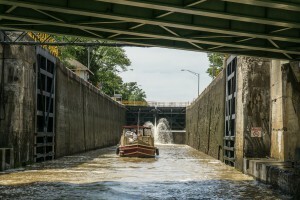 The current canal has large electric-operated locks that resemble those on the Panama Canal. You can save thousands of dollars traveling the Erie if you wish to experience the Panama Canal and don’t want to travel that far. Lockmaster leaving a lock to a lower level. To lock up and down the elevation changes, you enter a big box (the tank), the door swings shut, and like magic, water comes in or goes out and the boat floats up or down as much as 30 feet to the next level. The lockmasters (we met 7) are universally nice, very helpful, and work with new boaters to make locking through safe and fun. On the right, a Lockmaster similar to ours is leaving a lock that lowers the water level. Each lock holds six or so boats, sufficient room for the tourist traffic that uses the Erie Canal today. If you head west, there are towns every few hours, placed exactly the right distance apart by the post-colonial Chamber of Commerce. You can have a nice lunch by the water, drinks and music, fine dining, or just fast food. Being a vacation, we had breakfast on board, snacks underway, and consulted the guide books for the nicest place to eat when we felt like stopping for a meal. Pittsford was one of our favorites (lots of docking available, all free with free electricity). The town has several attractive places to eat, lots of interesting walking, and smiles every place you look. Enjoy antiques? You don’t have to look for an antique shop. The towns are from the early 1800’s and most have not been modernized. Beautiful churches are in every town, seven to ten in a town, many on the same block, “Church Street,” and all inviting you to look and appreciate their beauty. There was even a town with two slightly different Episcopal churches nearly across the street from each other. The Erie Canal made these towns rich, and many of the prosperous town people shared their wealth with donations for beautiful buildings. It’s a relaxing vacation, a nice place to visit, and a good reminder that even if it isn’t the Far East, much of our country remains unspoiled, beautiful, and very easy to reach.